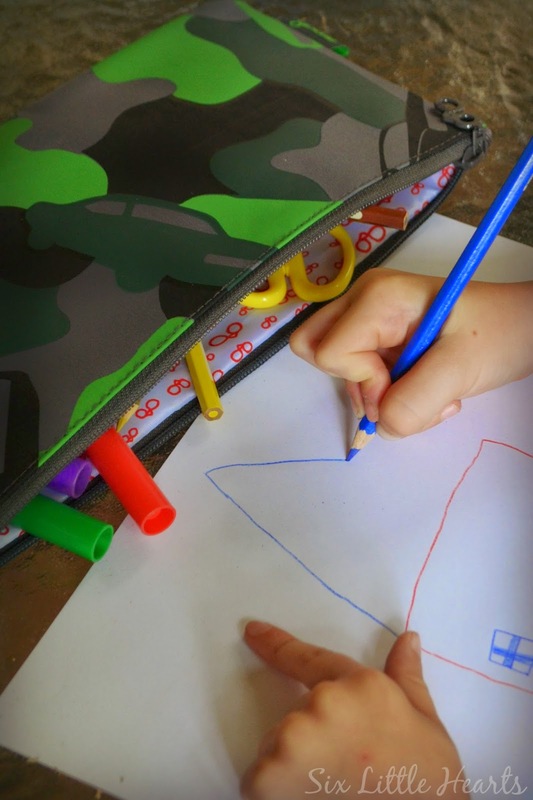 Gooie don't manufacture your average, dull back to school items like those depicted in the catalogues clogging our letterboxes at this time of year; or those blessed TV commercials that incite the loud moans and groans of children and adults alike. Meh! With the passage of each new school year, kids do a surprising amount of growing up don't they? Must be all that Summer sunshine, outdoors play and free time of the school break. Yup, kids who previously had no standards whatsoever, (because they were simply too little to care), suddenly get all attitudy when it comes to having the right gear. Gooie understands kids however, and their parents and this tricky relationship / situation entirely. Imagine a brand that has whipped up a wonderful collection of products that appeal to grown-ups just as much as their picky offspring and which packs together quality as well as a price-point that satisfies all? And...you can shop for it all online. I am relaxing already...are you? 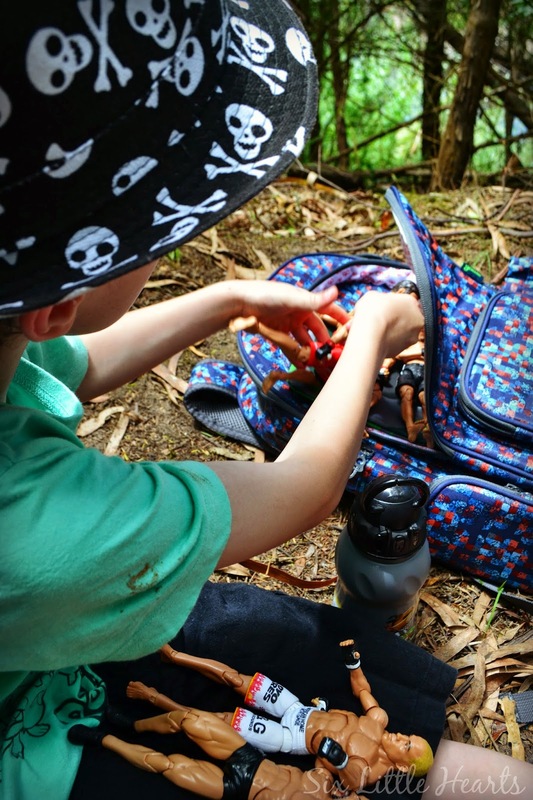 And so, we rounded up the younger boys and dished out their new bags, (kindly provided by Gooie), asked them to pack a few of their favourite things and took them on an expedition. 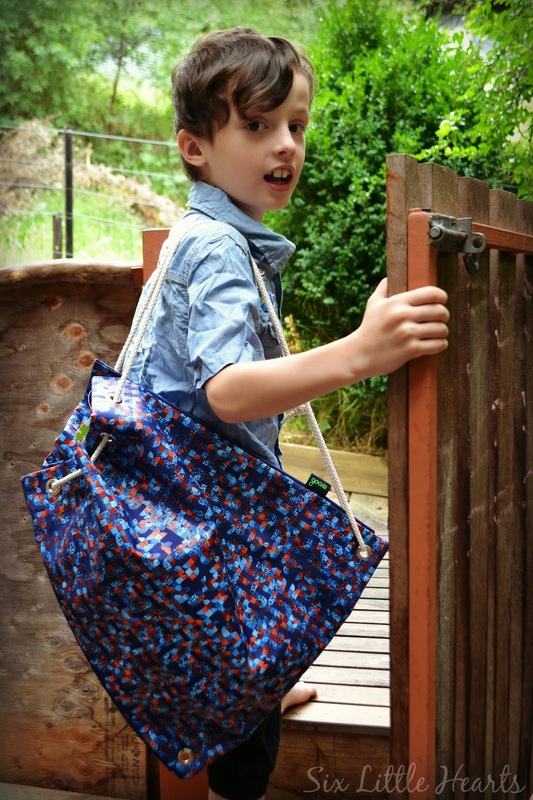 I should mention here that the boys adore the bags! The quality is amazing. They are foam-padded inside, fully lined in signature Gooie logo fabrics and remain lightweight. Serious quality that will stand the rigours of the school year and beyond. 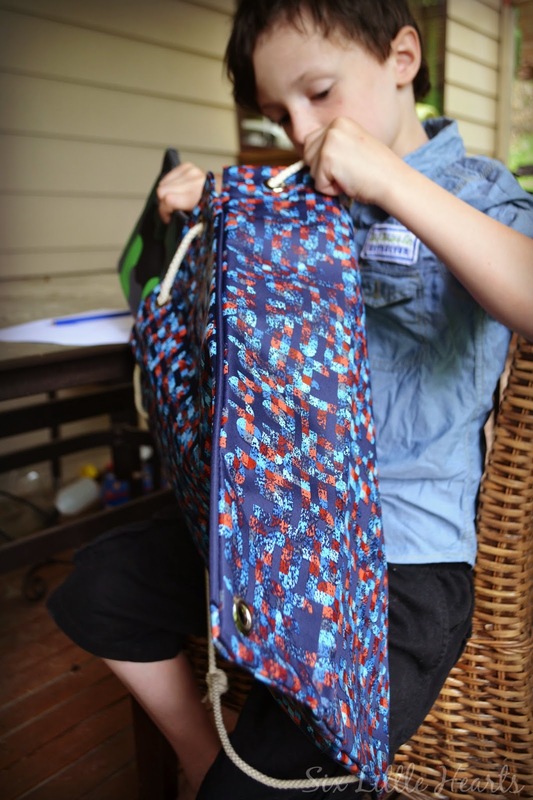 The bag has ample room for books, papers and pencil cases, even tech. There are several large and small pockets built onto the exterior for organising bits and pieces as well as a bottle holder and outer side zippered pocket for small but important things. 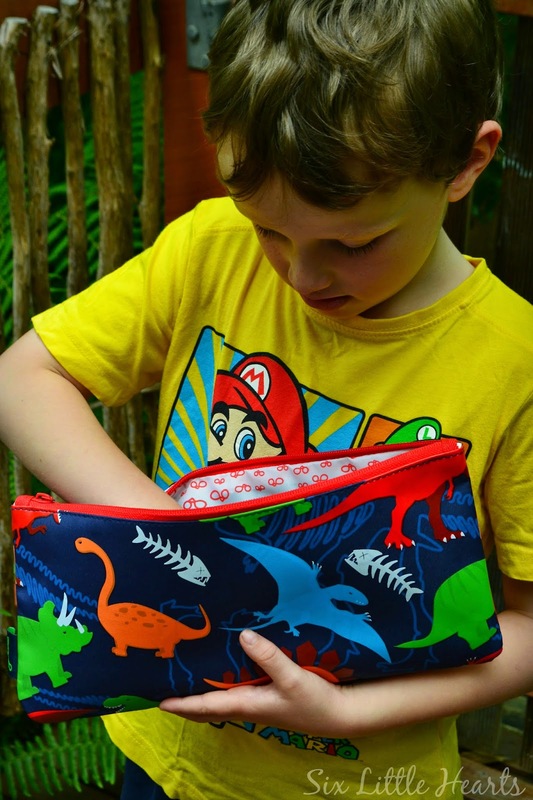 On the subject of pencil cases, Gooie have gorgeous designs to match their backpacks. Fully lined and well sized. Pictured are the Dino and Car-mo styles priced at $16.99. Don't forget a swim bag! These are lightweight, fully lined and sized to wear easily on little bodies. Drawstring cord straps make for quick outings and secure everything well. 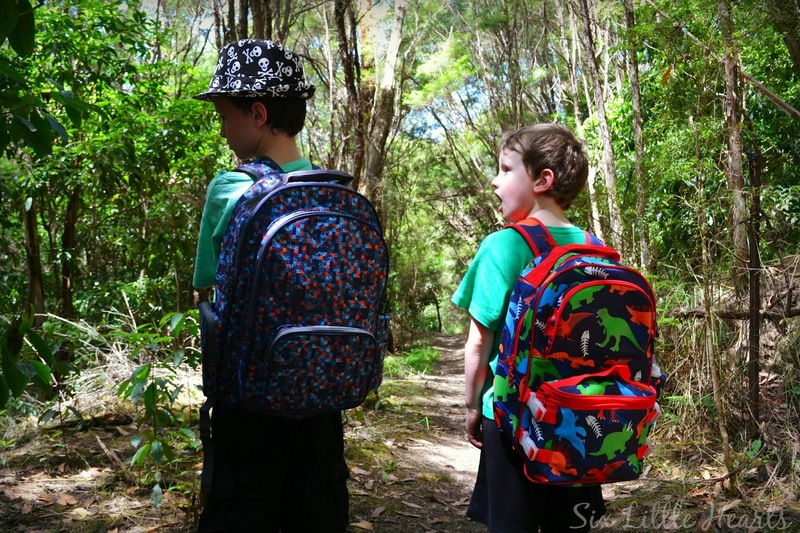 Fab for school excursions too. Pictured is the Xtreme design and it's priced at $19.99. All Gooie items are hand printed and delightful. Check out their full back to school range here. Like to win a back to school set for your child? pictured here in their *choice of designs for either a boy or a girl. 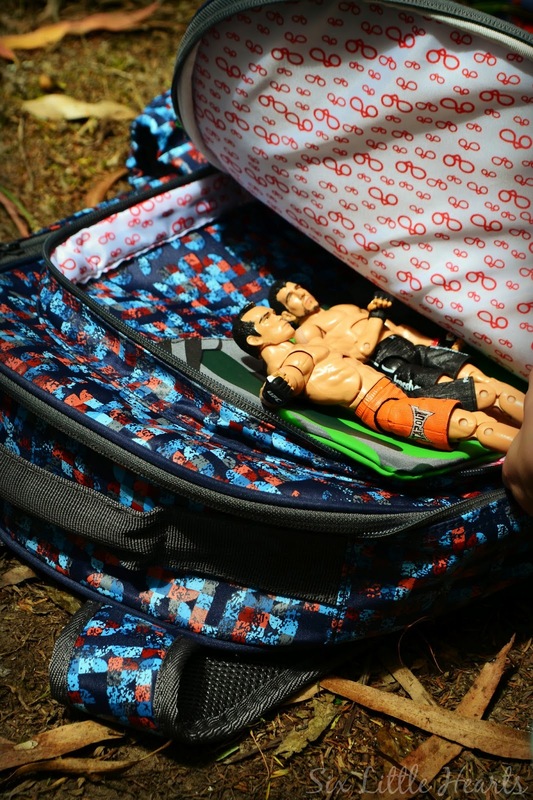 one pencil case ($16.99) and one swim bag ($19.99). Please share the love! Give this review and giveaway a shout-out on your social media to spread the word. We really appreciate this so thank you in advance. Options are below. Please follow Gooie on Facebook. Full terms and conditions for all giveaways and promotions can be viewed here. Giveaway open to Australian residents. *Disclosure: The items featured in this review were gifted. These are gorgeous!! 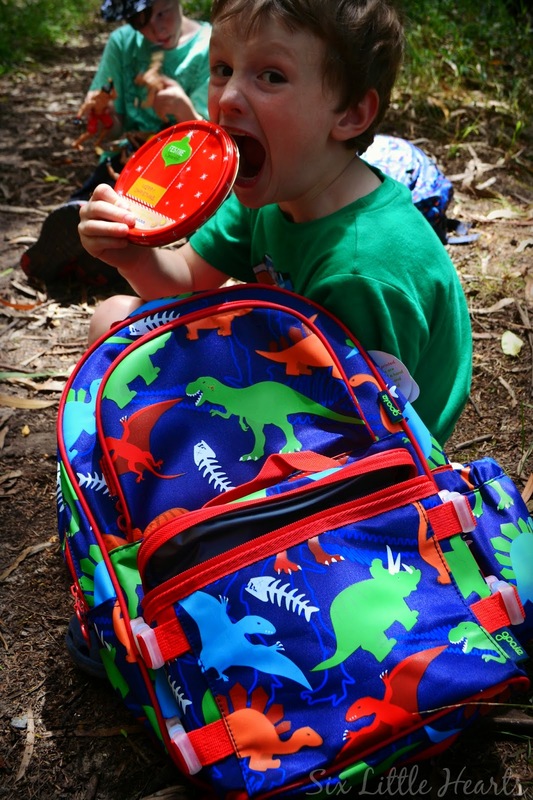 Love the backpacks and all the useful goodies you can put in there - and how cute are the pics of your kids! My favourite school holiday was a beach holiday. Living in country NSW a beach holiday was a real treat to see water!! We had hours having fun ! 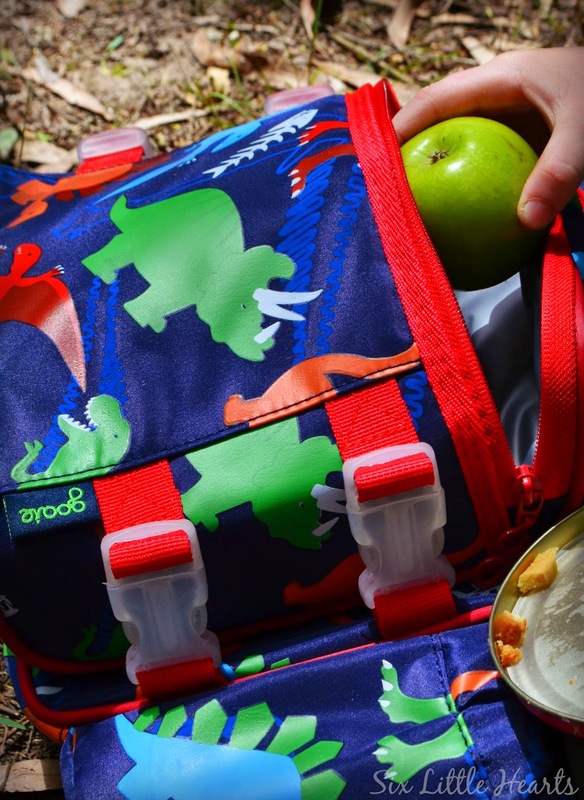 The dinosaur bag is so cool!! 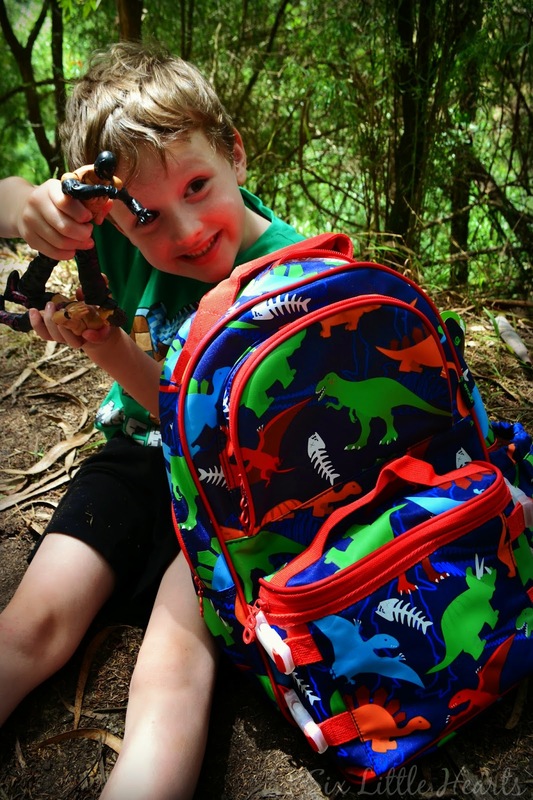 I would love a dinosaur bag for myself!!! Our favourite holiday activity would've been having a backyard campout. We set up our tent in the yard and the kids got to sleep out there. We topped it off with a BBQ and games. It was fantastic! 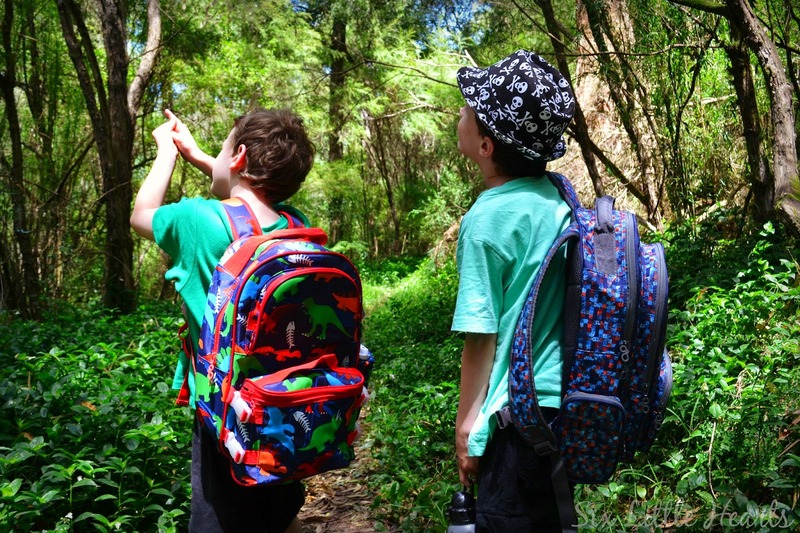 Our favourite holiday activity is to go bush walking for 360 degrees of nature and fresh air! It would have to be our trip away for 7 days to the Sunshine Coast. No rushing, just chilling by the beach, the pool. I will miss the school holidays because I am inherently lazy and dread going back to being the morning Nazi. We had an overnight trip away to Canberra. The kids were wide eyed as we treated ourselves to a stay at the Novotel, complete with indoor pool and all you can eat breakfast. Then we took them to the Christmas Lights Display in Civic along with a traditional merry go round ride. The kids thrived on the excitement, shining lights and overall festive atmosphere. They didn't know where to look next. Follow this with a next day movie of Paddington which had us all in stitches, then a trip to the Canberra Zoo and Aquarium on our way home. What a jam packed fun filled two days. The kids were exhausted, hyper over their two days of excitement and totally pumped full of enthusiasm. How blessed we feel to have enjoyed such happy days with our three gorgeous bright and bubbly kidlets. Just a little holiday, but a fondly remembered one. Sounds like a fantastic weekend Rachel - thanks for sharing and good luck! These bags look great, fabulous quality. Entering your competition for sure! So glad to hear that Natalie - yours likewise! Yes the holidays are zooming by. And catching waves with our children! I've been working really long hours to pay the bills, but I got 9 days off over Christmas to spend with the kids and we had a fantastic time! We even played monopoly a few times!! Enjoying the pool at our new house. Makes all the hours spent cleaning it worth it when you see the joy on their faces! Frolicking at the beach almost every day. Hooray for summer! Love the holidays but have to admit, looking forward to school starting back! Gorgeous bags and giveaway. Will definitely share! My boys would love the dinosaur design! Gooie gear would definitely get my kids excited about school. Still have a year for that day to happen! Its always nice to see kids enjoying things that don't involve technology. Th walk to Mutton Bird Island Reeves in Coffs Harbour, with views like this can you blame me. My girls love it. It's quite a walk for a 9 year old but she loves it. Thank you so much for sharing this - lovely! We went up the coast these holidays and weren't all that impressed with the cabin we were in.. however, Dora thought it was the bee's knees. She had her own room with a bunk bed and there was a great pool, aivary and playground. She thought it was the best holiday ever, which made sleeping on the most uncomfortable bed, the rain, the heat, the dirty cabin well worth it. Bahaha! The simple things huh?! The back packs look gorgeous. I've loved taking my girls to a local resort for a cooling swim as it's been so very hot these school holidays, it was so refreshing. I loved taking evening walks after dinner with my girls on the beach. It's one of the things I love about having a holiday house by the sea, hopefully they loved it too. Picking strawberries together has been a highlight. So much fun just spending time together and eating delicious warmed by the sun strawberries! Our favourite holiday memory of this summer would be swimming in the rain, the kids loved it, you have to make the most of the hoilday's. Swimming at a local reservoir surrounded by bushland & birds. The fresh waster was so soft & clear, we even found a baby turtle. Best memories are time playing with the grandkids...trampoline time where i fall over and they 'stacks on the mills' me! We went on a motorhome trip for the first time with kids during the last week of school holidays & it was fun. We travelled around Sydney and kids loved all the sight seeing. Moreover it was a great bonding time for our family because we used our phones for emergency situations only & did not carry any other gadget with us. These holidays we went to visit Grandma and Grandpa at the beach where the kids enjoyed bringing along all their buckets and spades (which Mum had to carry along with everything else on the way home!) and made fun body sculptured castles upon Dad. We discovered the free kids events at the libraries - we've made pencil holders, planted herbs, created a puppet theatre and a bookmark - all for free! Thank you everyone for entering, we really enjoyed hearing about your Summer fun! 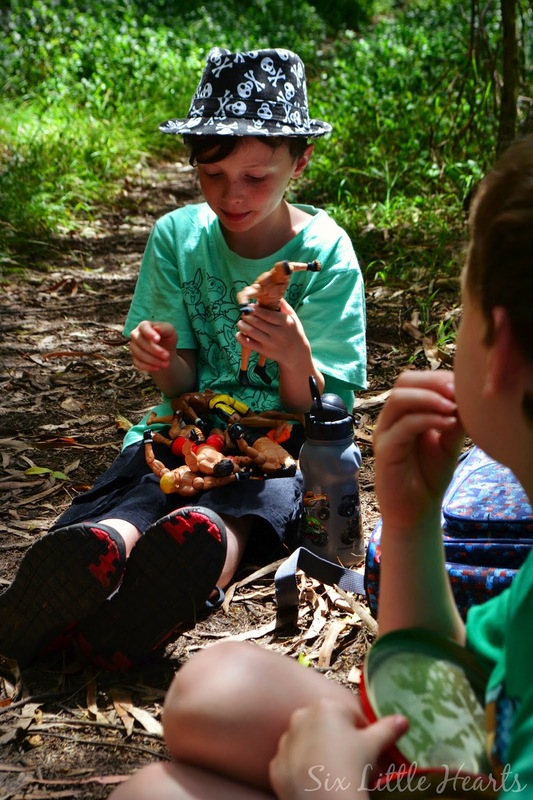 We love geocaching or as my kids call it 'treasure hunting'.